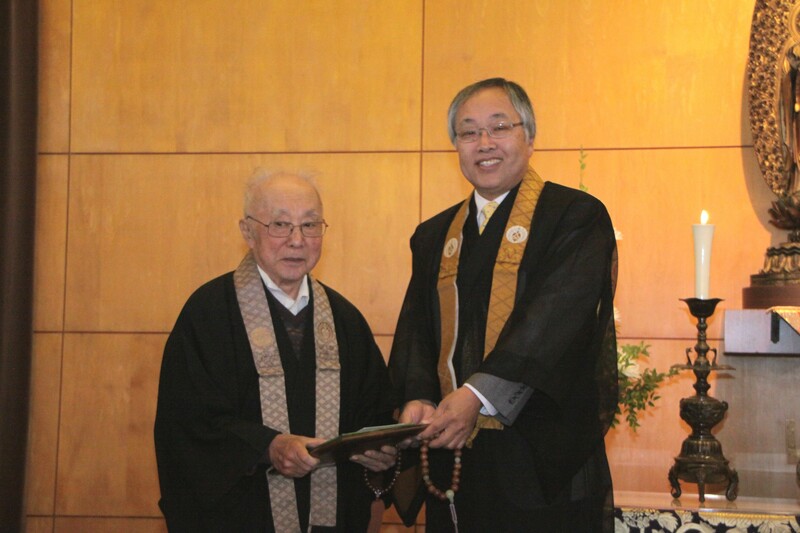 Dr. Taitetsu Unno, distinguished minister, scholar, translator and author, was presented with the first Institute of Buddhist Studies President’s Award, during opening ceremonies at the Pacific Seminar, held July 5, 2014 at the Berkeley Buddhist Temple. The presentation of the award was made by Rev. Kodo Umezu, Bishop of the Buddhist Churches of America and President of IBS. Dr. Unno is widely recognized for playing a major role in cultivating a broader appreciation of Shin Buddhism in America and inspiring and guiding new generation of scholars and ministerial leaders. He was responsible for laying the foundation for much of the educational programs conducted by BCA and IBS. He is a graduate of the University of California (BA) and Tokyo University (MA, PHD). He served as a minister at the Senshin Buddhist Temple upon receiving his Tokudo and Kyoshi ordination. He served on the faculty of Smith College, Department of Religion, from 1971 to 1990s as the Jill Ker Conway Professor of World Religions. His extensive publications on the subject of Shin Buddhism are: Shin Buddhism: Bits of Rubble Turn into Gold; River of Fire, River of Water, and Tannisho: A Shin Buddhist Classic.